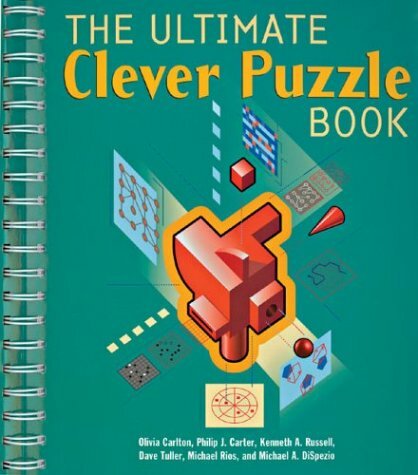 The Ultimate Clever Puzzle Book is by Dave Tuller, Michael Rios, Kenneth Russell, Philip J. Carter, and Michael A. DiSpezio. Most of these guys have been publishing puzzle books for years, several of which I've worked through myself. The book is spiral bound, and its dimensions (in inches) are 0.85 thick, 9.94 long, and 8.88 wide. There are a total of 320 pages, which makes this a very large puzzle book. The book is split into 4 sections: Crosswords to Exercise Your Mind, Challenging IQ Tests, Math & Logic Puzzles, & Critical Thinking Puzzles. SECTION 1: Crosswords to Exercise Your Mind - This section consists of 72 (count 'em!) crosswords, all taken from magazines from the 50s and 60s. None of the clues have been updated. This is a really neat idea, as working through some of these puzzles really is like a trip through time. The authors note that "back then, crosswords tested your knowledge of words. To solve them, you didn't need to know the names of minor pop stars or second-string baseball players. You just needed a big vocabulary and the ability to recall classical knowledge. "So when you encounter the clue 'Mr. Murphy of the movies,' you need to fill in AUDIE, not EDDIE. For 'Tennesses Senator,' the answer is GORE, but it's referring to Al Gore, Sr., not the recent vice president. 'Actress Barrymore' is answered with ETHEL, not DREW. The clue 'They will explore space' uses the future tense, since ASTRONAUTS hadn't yet gone up in rockets." Fun stuff. SECTION 2: Challenging IQ Tests - Having worked through a number of Carter & Russell books, I'm pretty sure this is mostly (or entirely) their section. This begins with their standard intro to their IQ tests, plus a ranking scale. No, these are not actual clinical IQ tests, but they should give you an estimate of your overall smarts and problem solving abilities. Having worked many puzzles like these over the years (and having designed quite a few myself), I can also tell you that the more you work, the better you generally get, as you have a good idea of what standard tricks to look for. There are 13 tests, with 20 questions per test, so 260 total problems. 60 minutes are allowed per test. Each test uses a variety of visual logic puzzles, vocabulary questions, math problems, and lateral thinking conundrums. While you will not get an actual IQ score per test, it seems to be a basic human need to challenge ourselves once in a while. These 13 tests are a good way to do this. SECTION 3: Math & Logic Puzzles - This section consists of 18 different types of "grid" puzzles: Black and White, Worms, Minesweeper (yes, like the computer game), Lighthouses, Hex Loops, Square Routes, Spokes, Battleships, Number Place, Alternate Corners, Rain Clouds, Square Numbers, Fences, Snaky Tiles, Cross Sums, End View, Skyscrapers, & Dominoes. There are 6-30 puzzles within each of these subsections, making hundreds of mini-puzzles. There is a brief intro to each subsection, followed by an example problem with solution, then you're off to the races. SECTION 4: Critical Thinking Puzzles - Probably the best part of the book. I enjoyed the crosswords and IQ tests I worked through (the math & logic puzzles were also good, but they're not my standard fare), but this is the truly fun stuff. Each problem has its own title, and is usually 1 or 2 short paragraphs in length. Most of them have a fun cartoon-like illustration or diagram. There are problems with coins, grids, wheels, cubes, patterns, roller coasters, M�bius strips, satellites & much more. There are 100 puzzles in this section, of very high quality. You can find The Ultimate Clever Puzzle Book online for purchase here.